IKEA made "everyday fabulous" for New Yorkers when it went design-crazy on the city. All in preparation for Design Week earlier this year, natch. 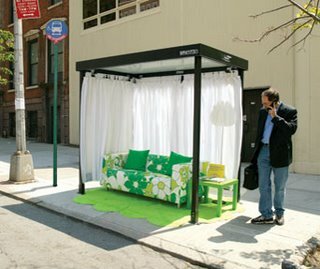 Some of the stunts over the five-day period included placing sofas and curtains in bus shelters, putting blankets and picnic baskets with bottled water in parks, placing pillows on the bottom of slides to protect kid's bottoms, framing a missing cat flier, and adding padded park benches to Union Square. My personal favorite--oven mitts were placed on the No. 6 train. "Good design can make the everyday a little better," said the tag line. Deutsch created the campaign.